Blue Valley North junior forward Lexy Farrington has recently received media attention for her work the last two years with collecting donated shoes to send to people in Guatemala. More than 400 pairs of shoes have headed to Guatemala. Farrington has helped the Mustangs to a 15-2 record for 22nd-year coach Ann Fritz. BVN has the No. 1 seed in Class 6A East and leads East with 60 points per contest. Blue Valley North is No. 4 in 6A. Derby girls, ranked No. 1 in 6A at 15-0, had a struggling offensive night and held off Newton, 37-28. Kennedy Brown delivered 11 points. Derby had a 17-0 run to take a 20-4 lead early, but Newton (7-9) came back. Sixth player Jaidyn Schomp delivered 10 points off the bench, including three treys. It marked Derby’s closest game this year and represented its lowest point total of the season by seven points. Derby shot just 27 percent from the field, but had another high-level defensive effort. Brown, a McDonald’s All-American and Oregon State commit, has 17.5 points, 12.3 rebounds and 3.9 blocks a contest. Junior Sydney Nilles is at 8.5 points, senior Aliyah Myers is at 8.3 points, and senior point Tor’e Alford, a Missouri State signee, is at 8.1 points and five assists a contest, one of the state’s top marks. Derby averages 1.04 points per possession and allows just .519 points per possession, both elite rates. The Panthers collect 36 percent of available offensive rebounds and turn the ball over just 18.4 percent of the time. Liberal girls, ranked No. 2, kept pace with Derby as the only other perfect team. The Redskins delivered back-to-back WAC wins Friday and Saturday at Hays High and versus Dodge City. HHS was ranked No. 10 in 5A, but the Redskins won 55-34 in a game that had a running clock. On Saturday, Liberal defeated DC, 47-36, in overtime. On Friday, Blue Valley Northwest defeated Blue Valley West, 37-33, as sophomore Megan Edwards led with 14 points and three rebounds. Topeka High delivered an upset win against Washburn Rural, 48-38, in Centennial League action. WR is 15-2, 10-1, and Topeka has the same mark. Freshman NiJaree Canaday had 15 points and 15 rebounds. Topeka High is sixth in 6A, and WR stayed third. Maize boys continued its magical year with a 46-45 victory against Campus and moved to 17-0. Maize is No. 1 in 5A and Campus was seventh in 6A. Campus missed a free throw with 1.5 seconds left. Brandle Easter, Jr. continues to have a big year with 21 points. Devon Koehn had 12 and Caleb Grill tallied 10. Maize has two one-point victories, a two-point win and an overtime victory this winter. Wichita Heights girls captured the City League with a 57-34 victory against Wichita South. Heights is fourth in 5A at 16-1. The Falcons only trail Maize South (16-0) in 5A West. Wichita Heights boys dropped a game to Wichita East last Tuesday after it beat the Blue Aces earlier this winter. However, the Falcons remained in strong position for the City League title with a 68-47 win against South on Friday. Heights received 15 points from senior forward Jaden Okon on Senior Night. Heights is fifth in 5A. McPherson had a milestone week. Jake Alexander cleared 1,000 career points, the 12th time a McPherson boy has accomplished the feat, according to Bullpup announcer Jim Joyner. Alexander tallied 20 points as McPherson won its fourth in a row and moved to 12-4 and is No. 10 in 5A. McPherson girls, the defending 4A-I champions, continue to have another big winter after Gatorade Player of the Year Taylor Robertson graduated. The Bullpups have won 13 in a row and stand at 15-1. Last week, coach Chris Strathman became the all-time winningest coach in McPherson girls’ basketball history after a 76-25 victory last Tuesday against El Dorado. Strathman moved to 274-53 by week’s end. McPherson is fifth in 5A. On Friday, Aquinas delivered a 56-24 win against Mill Valley on Senior Night. Aquinas is third in 5A. On Saturday, a third-quarter 3-pointer gave Alayna Townsell more than 1,000 career points in a big win against Olathe South, 51-31. Townsell is the sixth player to reach 1,000 for an illustrious Saints program that has reached state 24 straight years and won the state title last year. Last week, she signed Division I Hampton (Va.) University. Townsell’s basket gave via an assist from Madison Skelton. Aquinas is 13-2 and third in 5A. OS is fifth in 6A. Highland Park girls defeated struggling Junction City, 73-21, and sophomore Jae’Mya Lyons came back from a knee injury for her first game of the season. Lyons had 15 points. Andover Central’s Braden Belt reached 1,000 career points. The Jaguars, ranked second in 5A, are 15-1 behind a prolific offense. AC gets Maize South at home in a key game Tuesday. AC averages 73 points a contest. Junior Xavier Bell is 20.5 points, 6.5 rebounds and 3.2 assists. Belt delivers 19.3 points and 4.6 rebounds, while senior Easton Leedom delivers 15.9 points and 6.6 rebounds. The Jaguars continue to rank second in 5A. Bishop Miege, ranked No. 1 in 4A girls, cruised in its two games last week with a 76-22 road victory against Blue Valley Northwest and 64-33 versus St. James. Against BVNW, the Stags led 26-7 after the first quarter and 45-9 at halftime. Miege received 11 points and five rebounds from Faith Hawthorne, along with seven points and six rebounds from talented freshman Emajin McCallop and four assists by Jenna Harms. Miege was plus-12 on the glass and had 24 steals. Versus St. James, Miege led 22-4 after the first quarter. Payton Verhulst, one of the country’s top players, recorded 17 points, nine rebounds and four assists, all team-highs. Miege delivered 14 steals, twice as many as the Thunder, and shot 48 percent from the field. Jordynn Gonzalez delivered another big game with 13 points and two rebounds, and McCallop had seven points and three assists. Hawthorne finished with seven points and six rebounds. McCallop has delivered five points and 2.7 rebounds this year. The seven points was her second-most in a contest, and her six rebounds was a personal best. Payton Verhulst is at 15 points, six rebounds, 2.9 steals and 2.4 assists. Hawthorne is at 7.9 points and 5.1 rebounds, and Jordyann Gonzalez delivers eight points and 3.8 rebounds. Circle’s Carissa Beck, one of the state’s best 3-point shooters in recent history, committed to Butler County Communty College. Beck made a school mark eight treys as the T-Birds defeated Clearwater, 72-31, last Tuesday. Circle stands at 13-3. Beck missed four games this season but averages 9.1 points a contest. She has tallied 896 career points and shot 40 percent from 3 and 81 percent from the free throw line in her career. Beck has made 188 career treys. Circle is sixth in 4A and gets Augusta and McPherson this week. Anderson County’s Justin Rockers hit a buzzer-beating shot to beat Iola, 57-54, on Saturday. AC is 10-4 and will face Iola again Thursday. Phillipsburg boys had a terrific week with two key wins, moved to 15-2 and have won 11 in a row. Last Tuesday, the Panthers led by 28 after three quarters and defeated Hoxie, 67-49, at home. Hoxie was ranked second in Class 2A and is now fifth. Phillipsburg again stands fourth in 3A. On Friday, the Panthers stayed perfect in Mid-Continent League play with a 61-50 road win against Thomas More Prep-Marian. It yielded the first home conference loss for the Monarchs since they switched to the MCL. Trey Sides had 19 points and Ty Sides tallied 16, though senior Jonathan Hunnacutt earned team player of the game honors. Hunnacutt, who set the Kansas record for all-time kicking points and signed with Fort Hays football to kick last week, is 5-foot-11. Against TMP’s significantly bigger interior players, Hunnacutt had nine points and 10 rebounds. Norton girls (15-2, No. 7 3A) earned a solid victory, 59-38, versus Plainville last Friday. The Bluejays had balanced scoring with 14 points from senior Taryn Kuhn, 12 by sophomore Tessa Hauser, 11 by senior Allison Engelbert and 10 points from junior Tayli Hartwell. All three made at least 45 percent of their shots. Engelbert tied her career-high and season-best. Hartwell, the starting point guard, tied her season-best and was two off her career high. Kuhn leads the team with 16.3 points, 3.9 rebounds and 2.1 assists. TMP girls moved to 12-4 and remained undefeated at home and in Mid-Continent League regular season play with a 54-34 home win against Phillipsburg. The Monarchs, which are at Great Bend on Tuesday for their second meeting against the Panthers this season, have captured five in a row. The Monarchs outscored Phillipsburg in every quarter, including 10-3 after the first. Freshman Emilee Lane delivered 14 points and 12 rebounds, and senior Jillian Lowe had six assists. Phillipsburg’s Alexi Beach tallied 24 points, but the Monarchs’ defense had 11 steals and limited the Panthers to 24 percent shooting. Kyleigh Allen had 12, and freshman Megan Hamel tallied 10. It marked Lowe’s second double-double of the winter. Allen and Hamel both set career highs. Hamel, a key reserve, has played more frequently down the stretch and has scored 20 of her season’s 25 points in the last five contests. Santa Fe Trail’s John Long enjoyed another massive game with 41 points last Friday. SFT is 16-0 after a week that featured a 54-43 victory against Silver Lake and 81-56 at Osawatomie on Friday. Silver Lake is 11-4. Santa Fe Trail remained second in 3A behind Maur Hill. Larned boys have had a wild last five games. The Indians defeated Hillsboro, 62-59, in overtime, one of three OT contests in the last five games. Additionally, Larned has a 45-44 win against Nickerson and a 58-52 win versus Haven. The Indians are 4-1 in those contests. Larned is 11-5 and has a narrow lead in the Southwestern Heights sub-state where four teams have at least 10 victories. Class 2A has been full of upsets and last week was no exception with the No. 1 boys and No. 2 girls squads both falling. Hutchinson Trinity Catholic stayed perfect in Heart of America boys play with a 49-40 win against top-ranked Inman. Trinity was ranked fifth last week and is up to No. 1 this week. The Celtics led 20-15 at halftime and scored the game’s last eight points. Kaleb Hammeke paced the Celtics with 21 points and his brother Lucas tallied 13. Trinity is 7-0 in league, and Inman stands at 7-1. Inman dropped to second. Riley County’s Danielle Wagner made a last-second basket to force overtime and the Falcons defeated Alma-Wabaunsee, 61-51. RC had been 2-3 in its last five contests versus Wabuansee. Riley County, a 3A school, is 10-6, and had lost 58-32 to Wabaunsee on Jan. 25. Every 2A girls team has at least two losses. West Elk (13-2), Jefferson County North (15-2), top-ranked WaKeeney-Trego (14-2) and Inman (15-2) lead the classification. However, defending 3A champion Garden Plain is 14-3, and Wabaunsee stands 13-3. Garden Plain is No. 2, JCN is third, Wabaunsee is fourth, Inman fifth and West Elk sixth. West Elk stands sixth. On the boys’ side, Yates Center, led by Aaron King, is 14-2. Hoxie is 14-2, Stanton County is 15-2 and Pratt-Skyline stands at 17-1. The Meade sub-state features Skyline, Stanton County, Syracuse (14-3), Ness City (14-3), Meade (12-6) and Lakin (10-7). Ness City is third, Skyline is eighth and Stanton County stands ninth. Ness City defeated Otis-Bison, 87-50, with another big performance. John Pfannenstiel had 26 points and eight assists. Landon Reinhardt tallied 20 points, and Andres Rios had 13 points and 11 rebounds. Angel Guzman had nine points. Ness City (14-3) gets undefeated Central Plains at home on Tuesday. While Pfannenstiel has put up huge numbers with 22.9 points, 5.9 rebounds and 5.1 assists, NC has had excellent interior play with Reinhardt (13.1 points, 8.1 rebounds) and Rios (12.1 points, 9.4 rebounds). Ness City has tallied 1.02 points per possession with turnovers on just 16.2 percent of possession, an incredibly low rate. The Eagles collect 29.4 percent of available offensive rebounds. Plainville girls, with just an 11-player roster, are 9-8. Junior Aubree Dewey continues her remarkable season with 27.5 points, 6.6 rebounds, 4.4 steals and 3.7 assists a contest. Dewey has taken 417 shots – the rest of the team has 429 – and she leads the Cardinals with 42 percent field goal shooting. Bishop Seabury’s Zach Bloch hit a game-winning shot against Veritas for the second time this season in a 65-63 overtime victory. Seabury is 12-4 and leads the Pleasanton sub-state. Seabury is seventh. Central Plains girls defeated struggling La Crosse, 95-13, improved to 18-0 and have captured 102 straight games. Junior Emily Ryan tallied 38 points and is just seven away from 2,000 in her career. CP is No. 1 in boys and girls in 1A. 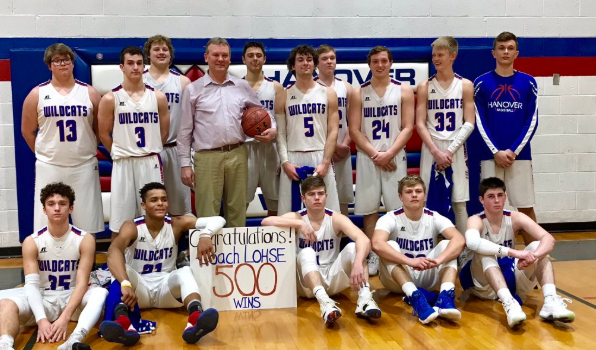 Hanover boys coach Kim Lohse picked up his 500th career victory. Lohse has captured six state titles at his alma mater. Hanover is 15-1 and has won 15 straight after a season-opening 63-56 loss against Bishop Seabury. Hanover is second in 1A. Wetmore’s Joel Hutfles set the single game steals record with 17 and broke the former record that stood for 37 years. He had 19 points, 22 rebounds and 17 steals against Linn. St. John boys (14-4) have three losses against Central Plains – all competitive – and have beaten Ness City twice. Junior Tanner Halling has 18.2 points and 7.4 rebounds, while senior Mason Osborne is at 12.4 points, 4.8 rebounds and 4.3 assists. Frankfort girls have posted back-to-back perfect seasons at home, which has totaled 23 straight victories. Emilee Ebert has cleared 1,500 career points and was a McDonald’s All-American nominee. In a 70-57 victory against Blue Valley on Jan. 29, Ebert had 34 points, 13 rebounds, three assists and three steals. Versus Centralia on Feb. 1, Ebert had nine points, six assists, five rebounds and four blocks. She is just under 18 points a contest. Ebert has been an extremely efficient shooter with nearly 60 percent from the field. Frankfort is 17-1 after big wins against Onaga (60-9), Axtell (69-38) and Troy (75-20) in the last week. Frankfort remained third in 1A. Rural Vista teams continued its impressive winters. On the boys’ side, RV defeated Wakefield, 53-22, and moved to 14-3, 8-1 in conference play and earned at least a share of the Wheat State League title. Sophomore Cameron Campuzano finished with his first career triple-double with 12 points, 12 blocks, 10 assists and five rebounds. On the girls’ side, the Heat moved to 17-0 with a 68-14 win versus Wakefield. RV had made state the last two years, but had not won the conference title in either year. This time, the Heat have won the conference championship. Cameron’s sister, Lauren, delivered 20 points. South Haven girls have quietly put together an impressive season with a 14-4 record and have won five in a row. This week, SH has a huge week with at Argonia on Tuesday and versus West Elk on Friday. SH’s last loss came to Argonia in the league tournament, and SH beat West Elk in the league tournament. West Elk is ranked sixth in 2A. South Haven have already matched last season’s win total from a 14-7 season after a 6-15 mark two years ago. Junior Brittney Byers has enjoyed a big year with 18.7 points, 4.1 rebounds and 3.1 steals a contest. Freshman Macey Pond has 10.7 points, 4.8 rebounds and three steals a contest. Argonia is 14-1. Both Argonia and South Haven are in the South Haven regional. Argonia’s only loss came against South Barber on Dec. 14. Argonia is into the poll this week at No. 10. Udall, which plays at Caldwell, on Tuesday, is 11-7. Junior Brayden Sadler continues to have a huge season with 26.1 points, 6.6 rebounds and 3.4 assists a game. Caldwell is ninth in 1A. Burlingame’s Montana Giffin tied the state record for free throws made without a single miss in game when he went 20-for-20. He tied the mark of Wellsville’s Brent Dorsey in 1993. Burlingame is third in 1A. Beloit-St. John’s/Tipton girls stand at 14-2, and the BSJT boys are 14-3. Both teams have just one loss in Northern Plains League play. This month, the Blujay girls are 4-0 and won every game by at least 14 points. On Feb. 1, BSJT had 22 points and 20 rebounds from senior Kara Eilert, and 24 points from Lauryn Dubbert in a 62-32 home win versus Wilson. Last Friday, St. John beat Chase, 55-32. Dubbert, one of the state’s best sophomores, has 14.2 points, 3.6 steals, 3.3 rebounds and 3.2 assists. Kara Eilert has 13.1 points and 13.3 rebounds, while Elle Eilert has 5.5 points and 12.6 rebounds. On the boys’ side, the Blujays defeated Chase, 63-37. Last Tuesday, BSJT won 62-32 against Lincoln as junior Braden Dameron made four 3s for the second straight game. This season, Ben Palen has 14.2 points and 8.6 rebounds, while junior Brandon Bates has 13.9 points and 4.7 rebounds. Dameron has 10.5 points and 3.4 rebounds. Bates had 38 treys with 46 percent beyond the arc, and Dameron is at 40 treys with 44 percent. Last year, Bates shot 35 percent on treys and Dameron was at 30 percent. Together, they combined for 81 treys. Kinsley girls defeated Ellinwood, 60-53, in overtime. Both teams, notably Ellinwood, have enjoyed massive turnarounds. Ellinwood senior Madison Ward gave the Eagles a fourth quarter lead and tied the game at the end of regulation. Josena Frame tallied 25 points for Kinsley, and Ward had 26 points and 10 rebounds. Kinsley finished the game on a 12-0 run. Rylee Gleason had 19 points for the Coyotes. Kinsley (12-6) has had big seasons from Gleason and Frame, who have helped the Coyotes improve from an 11-11 mark last year. Ellinwood girls are 7-10 after just one victory last winter. Ward is at 13.1 points and 11.3 rebounds. South Central boys, which has a huge home game versus St. John on Tuesday, is 16-2 with coach Roe Macias. Last Friday, the T-Wolves pulled away in the second half to beat a solid Pawnee Heights squad, 54-43. SC was down 24-22 at halftime and then outscored the Tigers, 15-7, in the third quarter and 17-12 in the fourth. Owen Alexander earned team player of the game with 22 points, including 10 of 10 from the three throw line, and 13 rebounds. The T-Wolves went 21 of 27 (74 percent) from the free throw line. South Central again stands tenth in 1A. Alexander has had a huge year with 19 points and 8.1 rebounds and has scored double figures in every contest. He has three straight 20-point contests. Alexander tied his season-high for rebounds. The 6-foot-4, 165-pound Alexander averaged 13.1 points and 6.2 rebounds last winter. SC has not lost in 2019. On the girls’ side, the T-Wolves are also 16-2 and has big seasons from its two senior standouts: point guard Bri Rutherford and post Jordyn Jellison. Rutherford has 22.9 points, 5.3 rebounds, 3.6 steals and 2.6 assists a contest. Jellison averages 10.6 points and 7.1 rebounds. Last week, SC won at Pawnee Heights, 57-25. This week, SC gets St. John at home on Tuesday and a huge game Friday at Spearville. That game will decide the SPIAA championship. Both squads are 10-0 in league play. SC is fifth and Spearville eighth in 1A. Spearville girls (15-2) bounced back from a non-conference loss at Kinsley, 42-39, on Feb 1. Last week, the Lancers won at Hodgeman County, 46-40, on Tuesday and then beat Ingalls, 44-26, on Friday. Sophomore Alissa Heskamp has 15.1 points, 4.6 rebounds, 3.6 assists and 3.6 steals. Junior Ehlaina Hartman delivers 14.1 points, 6.1 rebounds and 2.9 steals. South Gray (17-1, No. 5) earned two wins last week, at Fowler, 80-24, and versus Southwestern Heights, 73-64. Clifton Miller, who recently went over 1,000 career points, had 23 points and six assists, both team-highs. Austin Jantz led with 14 rebounds and had delivered 22 points, same as Aaron Skidmore. Miller has 19.8 points and 6.9 rebounds with 3.4 assists and two steals, while Jantz has 17.3 points, 6.1 rebounds, 3.6 assists and 2.2 steals. Skidmore has been a breakout player with 15.8 points and 6.5 rebounds. Miller has sunk 2.3 treys per contest. The Rebels were just 2 of 10 from long range, but 26 of 42 (62 percent) on 2-point range and had a big edges in rebounding (plus-nine) and free throws made (plus-eight). South Gray girls have captured four in a row and stand at 14-4 overall, 7-3 in league play. Hannah Askew has 13.7 points and 9.6 rebounds, and Emma Jantz is one of the state’s leaders in assists with 6.6 points and 3.7 assists a contest. Osborne is 17-0 and No. 8 in 1A. Darnell Holloway, who signed with Fort Hays football, had 19 points, 16 rebounds and five steals in a 67-58 win against Stockton on Friday. Keith Riley, longtime Hill City Ringneck boys head coach, went over 700 wins. He has three state titles (1970, 1978, 1998). His 1998 team that featured his all-state all-classifications player/son, Geoff Riley, was one of the best in 2A Kansas.